Fortified With a Mixture of Vitamin E, Chamomile and Aloe. 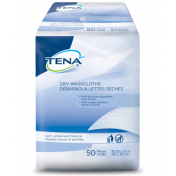 Tena Classic Washcloths are convenient, pre-moistened wash cloths that are naturally gentle on the skin. If you've been searching for a gentle, effective way to treat healthy (yet fragile) skin, look no farther than these fresh cleansing wipes. These convenient, pre-moistened wash cloths are ideal for everyday perineal cleansing or skin cleansing and have been dermatologically-tested, making them the ideal cleansing cloth for sensitive skin. Comprised of a soft, cloth-like material, you can't go wrong with these gentle and effective cleansing wipes. 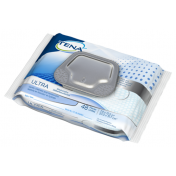 Tena Classic Washcloths come in convenient, soft dispenser package that is ideal for caregivers. Unlike other personal cleansing wipes, these premoistened washcloths are fortified with aloe and vitamin E, creating a soft, breathable personal wipe that soothes irritation caused by frequent changes. 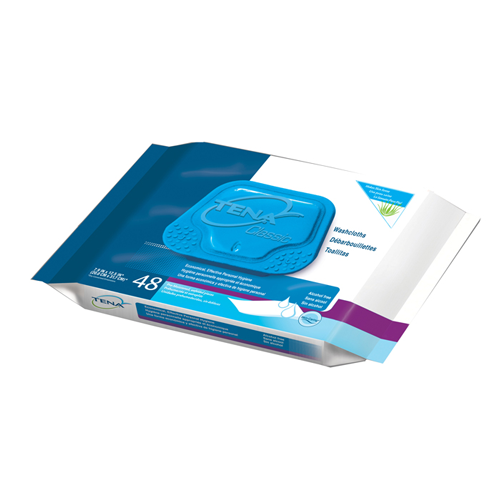 You may also be interested in similar cleansing wipes, such as Prevail Disposable Washcloths. Took care of my elderly mother for over a decade, but especially needed these her last 2 years of life. Would buy by the case (or more) and so had 4 packages left after she died and now use them myself. Kind of wish they were unscented--that's my only complaint. As a caregiver, and loving wife, I’ve been using this product for a little over 3 years now. I was introduced to Tena Washcloths from rehab. I’m always in the market for a better product, but have yet to find one that works better than this one. Tena has a great line of products. I keep coming back to Vitality Medical for the most reasonable prices I’ve found surfing the market. Thank you for helping make my life a little less complicated. Been using this product for about 2 years and have no complaints. The cloths stay moist and the package seal reseals every time. Oh, and the price is right. Our first introduction was at a rehab facility that they provided. I came home and found you on line and ordered 3 cases. They are so soft and strong. Wonderful, helpful product, great price and great service. Thank you. The other review is obviously someone who works at TENA. Does a regular person really talk like that??? "Do you know that these wipes also have Dimethicone, Aloe, Vitamin E, and Chamomile for maintaining our skin healthy, soft, and vibrant?" Come on, please. 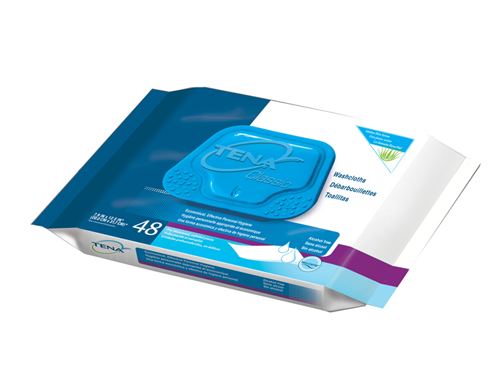 There are so many improved features in TENA Washcloths that you will rush to get one pack for yourself. Out of my experience and need for perfect cleanliness, TENA Washcloths was undoubtedly satisfying in infection control. Do you know that these wipes also have Dimethicone, Aloe, Vitamin E, and Chamomile for maintaining our skin healthy, soft, and vibrant? Thanks Vitality Medical for this great product and price.